Organized in 1966, the Seven Valleys Historical Society is dedicated to preserving the history of Callaway and the surrounding area. Visit the Museum. Experience Our Story. In 1970, the Seven Valleys Historical Society purchased the Historical Medical Building with the vision of making a Museum. Over the years, this building housed a Doctor’s Office, Café, Funeral Home, Bakery and Appliance store. Through the acquisition of many donated and loaned items, both levels of the Museum were soon filled with historical displays. A second building, the Annex, is located across the street. The church was built in 1890 at a cost of $1,500. In 1894 a tornado knocked the church off its foundation. It was later moved a block west of the original site. The last services were held in 1982 and in 1995 the building was given to the Village by the Episcopal Diocese of Omaha to preserve as a Historic Landmark. In turn the Village leased the church to the Historical Society. The cabin was built in 1876 on the Young Ranch, 7 miles East of Callaway. 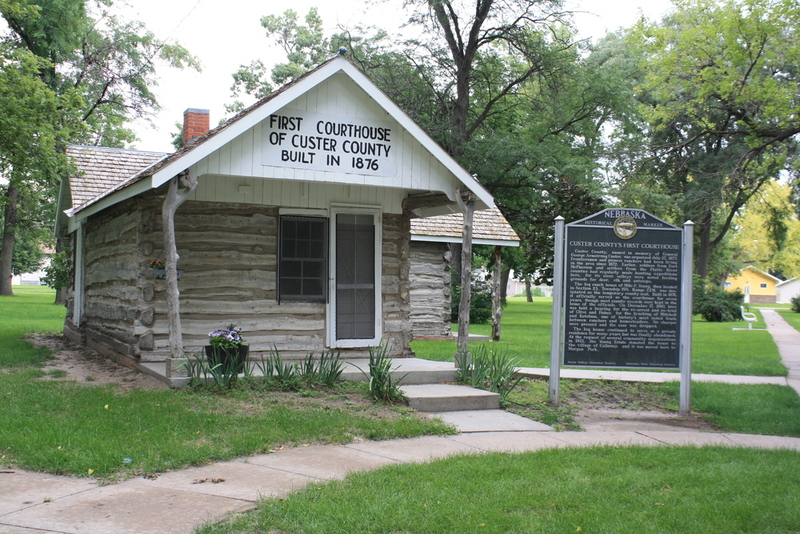 It was used for early official Custer County business before Broken Bow was designated as the County Seat in 1882. In 1933, it was moved to beautiful Morgan Park in the heart of Callaway and used as the Public Library until 1960 when the space was no longer adequate. The Log Cabin is Village property under the auspices of the Historical Society and was renovated in 1999. Across the street from the main Museum building is our Annex. This building is home to many larger items and displays. Some of the areas of interest include Railroad, Farming, School and Special Interest memorabilia. All displays have easy access in this ground level building. The Museum is open daily, various hours and for all major events going on in the Village. Learn more below or contact us by phone or email. The two story brick building is a historical site in itself, but once you come through the doors, prepare to be amazed at the many collections preserving our heritage in the Seven Valleys Area. Our dedicated local volunteers diligently care for and showcase the hundreds of precious antiques and heirlooms donated or loaned to the Seven Valleys Historical Society. Another great asset to our Museum is our "Research Center". A great number of volunteer hours have been spent compiling information on area marriages, military records, businesses, schools, historical events, and cemeteries. Seventeen cemeteries have been documented with family linkages and obituaries. Many contain tombstone photographs. Approximately 10,000 death records have been documented and are constantly updated. This is a great asset to the community for those doing genealogy research. This Church was one of the first Churches to be built in the Seven Valleys Area. The building is cared for by the Historical Society and the most recent project was having a brick display tower built to showcase the unique bell original to the Church. The bell project was completed in the summer of 2015. The beautiful craftsmanship and precious stained glass windows will take you back in time to a period where skill and pride in the builders work was very apparent. We acquired the Annex, across the street from the main Museum building, in 1997. Larger items are housed here along with a wide variety of interesting vintage and antique artifacts from the Rural, Railroad and Rodeo days gone by and much, much more. The areas of interest here are numerous.....stroll through the Annex and you will find yourself enjoying a "back in the day" experience. Plan to visit our Museum, you will see the many reasons why we are so proud of the history of our Seven Valleys Area. And while you are in our quaint and quiet little Village along the Soup Loup River, notice all that Callaway has to offer. We are home to the Callaway District Hospital and Medical Clinic, the Callaway Good Life Center, a K-12 School District, the Nigel Sprouse Memorial Library, the Seven Valleys Senior Center, a city Park, Pool & Playground, plus our local business district and several Churches. Callaway is host to the annual Pioneer Picnic Celebration in June that includes a Rodeo, Parade, and Alumni Festivities and in September we host the nationally recognized Kite Flight. Visit Us!!! You will be glad you did!! !